This photo dates from the early 1900's, but this corner shop is still a newsagents to this very day. As you can see by the sign on the wall to the right, it was also the local Post Office when this photo was taken. For those who don't recognise it, the shop stands on the corner of Saunders Rd and Wensley Rd. That dog is the only survivor. He still toddles up and down Saunders Rd most days. Is that a CCTV Camera just to the Right of the Bedroom Window Cill Colin ? I think it's a triangular shaped detail to the top of the fancy timber moulding. There's one on the opposite extreme, on the Saunders Road side. Get some new specs. 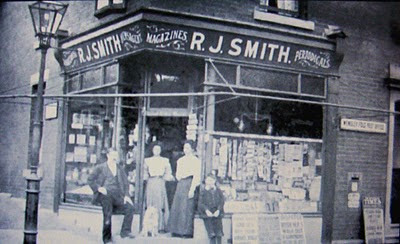 R. J. Smith was still running this newsagents in my 1925 directory, which would be about 18-20 years after the photo was taken. I'm sorry I don't have any of Wensley Rd, not that I can think of. I have one of Wensley Fold School, but that was around the corner on Apple St. Your wish is my command sir. It's now on (14-09-13) and a little section of a street plan to go with it.